This is a post I’ve been excited to share for weeks. If you don’t already know the super awesome Mie of Sewing Like Mad has been doing a fabulous Sewing for Kindergarten series. Like so many of us kid sew-ers Mie has a little one who started kindergarten this year. She decided to do a cool series where those of us with kindergarteners show some fun garments off. For me littlest niece L started real school (all day 5 days a week) which let me tell you I hate. Like really not being able to call her in the middle of the day or swing by for chats and pictures it’s just silly. But back to the series, L wears a uniform to school but as some of you know she is a ball of personality. I decided I wanted to sew her some outer wear that was as fun and quirky as she is. Coincidentally she just celebrated her 5th birthday and is currently madly obsessed with Totoro from the anime movie My Neighbor Totoro which you probably gleaned from my Instagram feed. 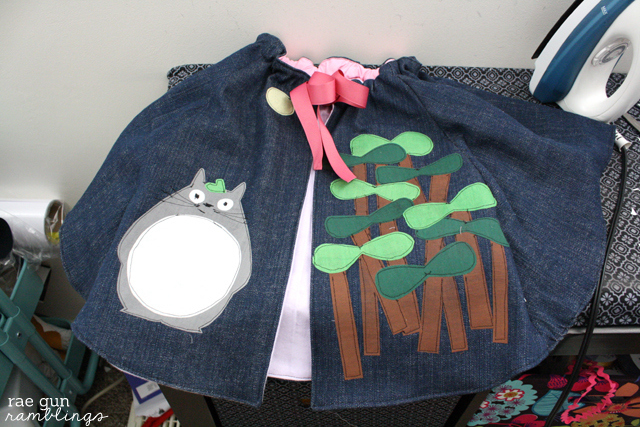 So I thought what better birthday present than a Totoro cape. 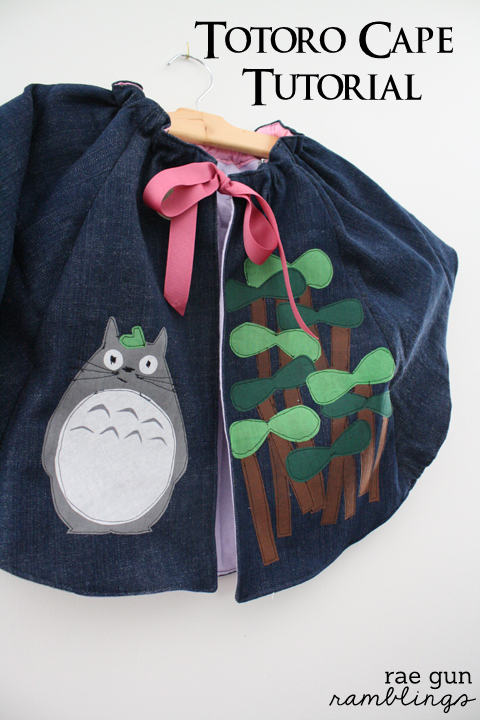 After all I always do handmade gifts and she did have a Totoro themed party (yes I’ll post about that soon). I think it turned out cute and she was super excited when she saw it. 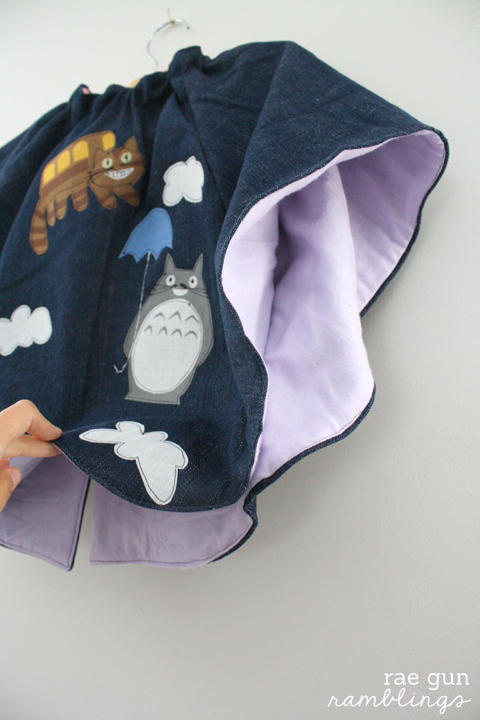 So here is a Totoro cape tutorial if you want to make your own, or really if you want to Totoro-ize anything it doesn’t have to be a cape! Start of by making your applique pieces. I searched for Totoro coloring pages and found a good base. I cut it out for the shape and then tried to scale it down. I didn’t find anything good for the Catbus so I kind of free handed it. You can see all my shapes above. The trees were just long strips cut at different lengths. Make iron on fabric out of the appropriate colors in sizes big enough to fit your shapes. If you’ve never made your own iron-ons see my iron-on tutorial, but basically you just iron heatbond onto the fabric, trace your shape, and then pull off the paper when you’re ready to use it. Cut out your cape. To line it I just cut one sent out of the outter fabric and 1 out of the lining. Take the outer fabric and position your applique pieces. Iron on. Then top stitch to add details. I did the blacks of the eyes, whiskers, teeth and around all the edges of each piece in black and then I did the umbrella handle in white. Sew the cape pieces together but don’t finish all the steps (you just want it to be one big piece of fabric) do the same with the lining. Then with right sides together sew the lining to the outer cape flip right side out and finish according to the instructions. I hope you like it. Make sure to check back soon to see the Totoro party and the crazy Totoro Mermaid dress that L requested for her party. Make sure to visit Sewing Like Mad to see the other great projects that are a part of the Sewing for Kindergarten Series and enter the fun giveaways and sew-along Flickr groups which aren’t just for kindergarten! Seriously guys I have been BLOWN AWAY by the creativity of the other participants. Like really they are so awesome. 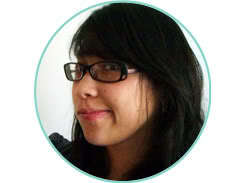 Oh Mie you’re so nice. 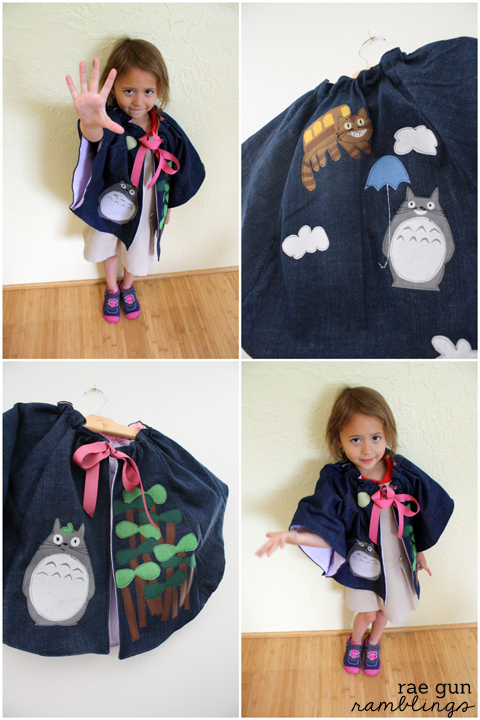 Thanks so much for the challenge and yes I think you could totally pull off wearing a totoro cape! Oh wow! I was thinking about buying a sewing machine and you just gave me a reason WHY i should! Its so pretty! What a cute cape! I love love love your appliques. Very pretty! Love this! 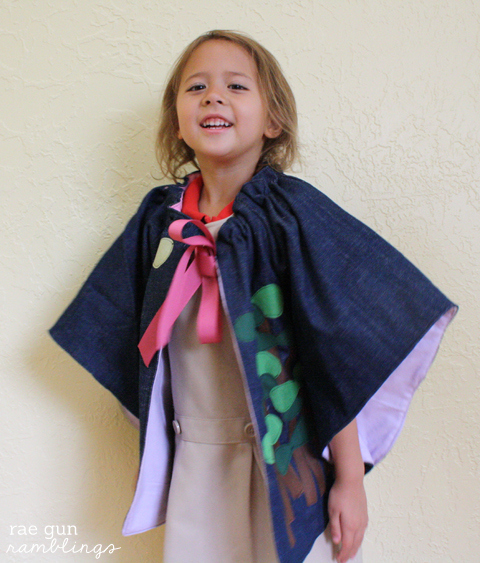 I have been wanting to make some capes for my little ones and this is just adorable! thanks! You should totally do it it was really easy and it turned out way cuter than I expected it to! 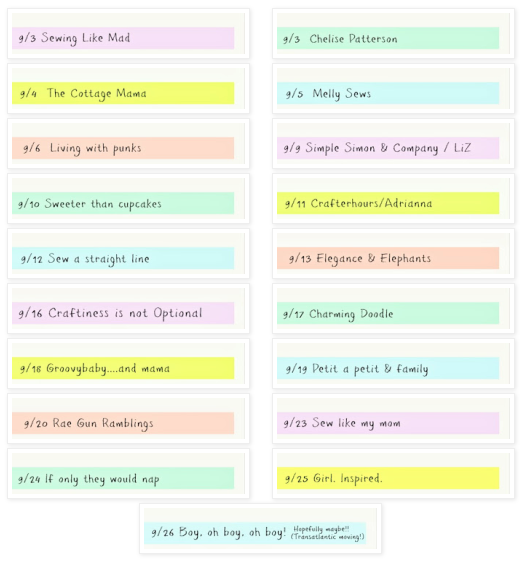 I’m weeks behind in my blog reading (Halloween order rush and all. You definitely know all about that! ), but I remembered this and had to come back to tell you that You Totally Rock! 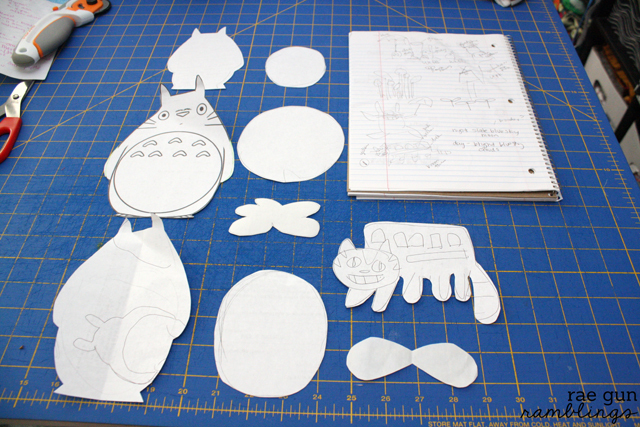 I adore Totoro (especially the soot sprites), and have been trying to get my kids to latch onto any of the ghibli films so that I can do projects just like this! I can’t wait to get to the post about the party. I already know it’s going to be adorable!